With Facebook Auto Reporter you can report on multiple accounts/ groups or pages on Facebook with current logged account automatically. More versions will be introduced later for sure. For Facebook Auto Reporter you will need Facebook direct report links (short reporting links). For reporting automatically on Facebook using Facebook Auto Reporter you will need Facebook direct report links (short reporting links). 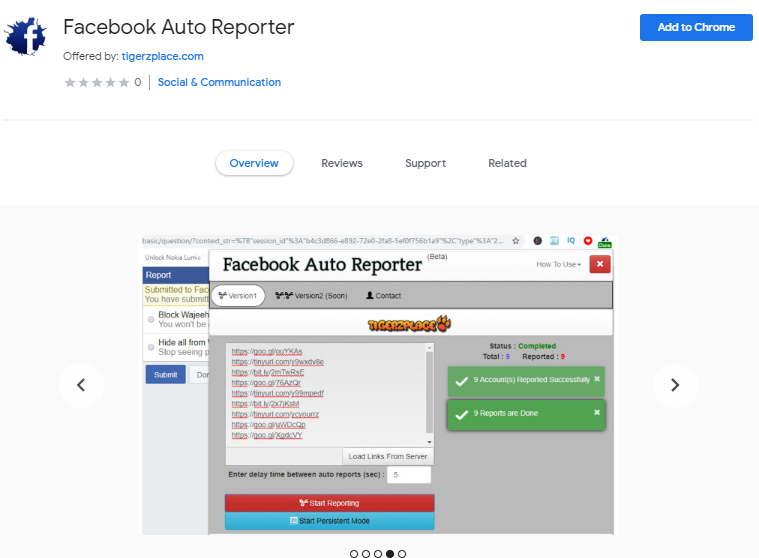 It basically automate your manual reporting which you might be doing manually because of such profiles, pages or even groups which are offensive or threat on social media and you want to report it. 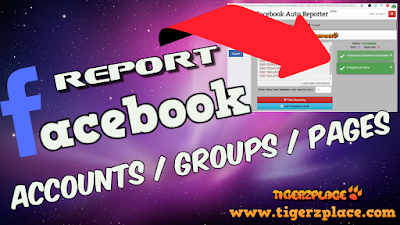 So you create short report link by which user only need to visit that report link and just check (Submit to Facebook) and click submit. This tool pretty much automate this visiting and clicking required for submission. Providing manual input user interface. Controlling and checking reporting links. Wait for one minute after every 10 reports. Notification alerts for every action handling. Can report multiple links with security checks. Controlling the content and providing safe use. Providing browser action and persistent mode. Bot Feature for almost any account/page/group. Excluding all raw or damaged links to save time. You can also load reporting links from PCD server if you are just a reporter for them or even a helper and want to help out the community to remove all the bad, offensive and fake accounts, groups or pages from Facebook. You only need to add the extension to your chrome browser and open it. Once loaded just click 'Load Links From Server' and it will automatically pick all the links submitted by the PCD to your reporter. Then just start reporting, and that's it. The Reporter will start reporting on links one by one (Safely). Ok first thing first, you will need Facebook Auto Reporter. You can get it from chrome store. Once the reporter is added you are good to go with further reporting step. The tool is quite simple; in order to report using FAR, you will need Facebook direct report links it actually the same short reporting links I used in the testing video. So that was the first requirement in order to use FAR. Secondly the reporter won’t work if you are not logged in. Because in version. The reports will be generated from the logged account in the browser. Hopefully in version 2 you will be able to provide other multiple accounts just like the old v2 script but the extension will be much better. Now to get started with reporting, first you need to know about the cases how you can use the reporter. There are two way you can report on multiple accounts automatically on Facebook using Facebook Auto Reporter. In user case one user can use the reporter for just simple reporting. In simple reporting the users will provide their short reporting links and click “Start Reporting”. 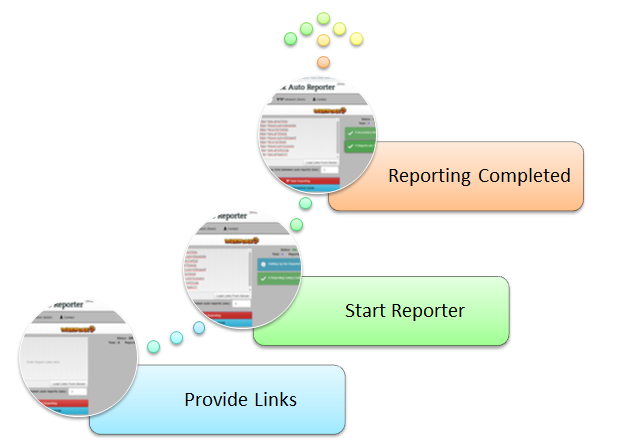 The reporter will perform automatic reporting till the last link in the list provided by the user. 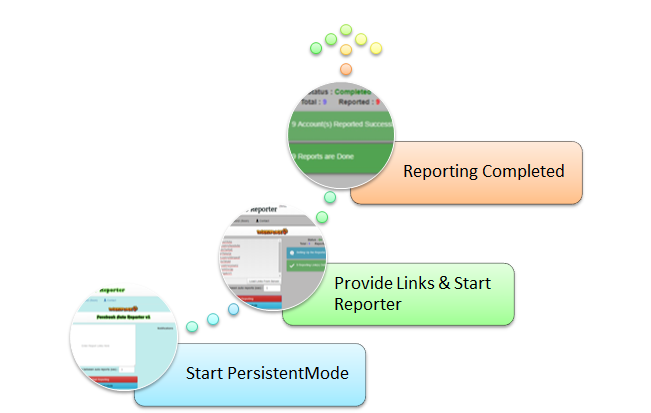 Once reporting is completed the reporter will stop reporting and will notify the user with full reporting detail. But the user can't interact with browser during reporting at all. Report have to wait till the reporting ends. This mode is good if you are just reporting 1 or 2 links other wise you should user persistent mode. Persistent Mode just changes the behavior of interaction with browser, the rest cases is the same. AS this case is simple reporting but in persistent mode there is just one additional step to do in order to start simple reporting in persistent mode. Before clicking “Start Reporting” user have to click “Start Persistent Mode” this will open a new pop up with the same extension. Now user can use the reporter for just simple reporting in persistent mode. The only difference in Persistent Mode is that if users want to do their work in the same window, so they can do whatever they want and the reporter will not stop if users changes that tab with just only one condition. Just don’t mess with the open tab on which the reporter was started. Let say initially you started on tab 1 and the reporter started. Now you can open new tab in the same window or can open new chrome window and can work whatever you want just don’t close tab 1 and the reporter will automatically report all the links. It will also notify the user with a small badge on the icon of extension in the right top corner. Hopefully you got the points. Now lets have the method for automatic reporting on Facebook with Facebook Auto Reporter. Paste your short reporting links. Click Start Reporting (Make sure delay time is not less than 5). That's how you can use Facebook Auto Reporter to report on Facebook accounts automatically. One last thing I wanna mention is this “Load Links from Server”, so it’s straight forward when you click on this it will load short reporting links from a server. I’ll make a detail video for this but If you want to help us out to remove fake accounts or may be any account, group or even page from Facebook is spread hate, highlight hate speech or something like that so just don’t search out for those accounts you only need to load links from our server and you are good to go. Pero de que sirve que agregue estos enlaces cortos de informe?, en momento pongo el link del facebook de la persona que quiero denunciar? Simplemente no puede usar el informe con enlaces normales, ya que sería inútil como su versión 1. El reportero es útil cuando se trata de varios informes, especialmente si tiene un grupo que, a diario, informa sobre varias cuentas, por lo que en ese caso es breve. Los enlaces de informes aceleran mucho los informes. Aparte de eso, el sciprting se realiza de tal manera que el reportero detectará el enlace directo y se marcará como un enlace de informe incorrecto. Por eso no puedes usar el enlace directo del perfil de usuario.